Earn Waypoint Rewards and Spend Your Points Today! Just recently, I received the opportunity to get my hands on an inflatable, belt-style personal floatation device called the Onyx M-16 Low Profile Personal Floatation Device (PFD). This unit is rated by the U.S. Coast Guard as a Type V PFD, but it can function very well as a comfortable floatation aid or Type III device. 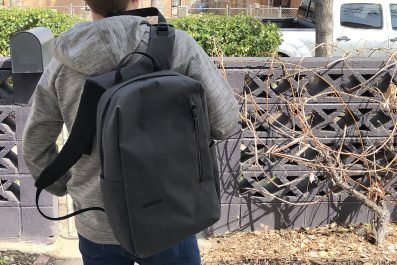 The most important part I recognized immediately was the small, lightweight design. At first glance, the Onyx M-16 looked more like a caddy for my titanium fishing pliers than something that could potentially save my life one day. The lightweight, belt-style device is much different than any other type of PFD I have ever used and is much more suited for my desires on the water. Honestly, the thought of wearing a traditional life jacket on the boat all day is repulsive. As a finesse angler, freedom of movement sits at the top of my priority list and wearing a traditional life jacket is far from my desires or wants. Sure I want to live a long life and I don’t want to succumb to drowning one day, but wearing a life jacket while fishing is not my idea of a joyful experience. But, a belt-style PFD such as the Onyx M-16 isn’t like a traditional life jacket nor is it like the other inflatable life jackets on the market that wrap around the neck and back. Belt-style PFD’s offer complete freedom of movement and life saving abilities without the weight and bulk of alternative PFD’s. Like many, I learned to swim at a very young age in the nearby ponds and local swimming holes. While I may not win a 200 meter medley unless I was the only one in the heap, I still rate myself as a proficient swimmer with the ability to endure extended durations inundated for a long period of time. My on-the-water talents are more suited with a rod and reel in hand and out of the water versus inundated in fish habitat. Regardless of my so-called swimming abilities, I enter into a potentially life threatening situation every time I sail away from the dock. Some type of life saving device could alter my outcome in a drastic way if an emergency situation arises. Hundreds of thousands of people around the world die from drowning incidents each year. As expected, many victims are children or adults lacking the ability to swim. In many of these situations, PFD’s would have saved a large portion of these lives. But why are PFD’s so important to avid swimmers? Out of the estimated yearly deaths, 25 percent are known as proficient swimmers. Regardless of one’s ability to maneuver safely in the water, water incidents can be potentially fatal even for the best and most proficient swimmers around the world. One of the main causes for drowning in America is from boating-related incidents. For over 40 years, I have spent countless hours on the water casting lures to my favorite finned species on boats. 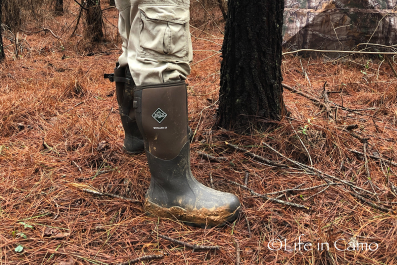 And just like most anglers enjoying their favorite fishing hole on the lake, river, or estuary, a full complement of life-saving devices are on boat somewhere buried away from the light of day. 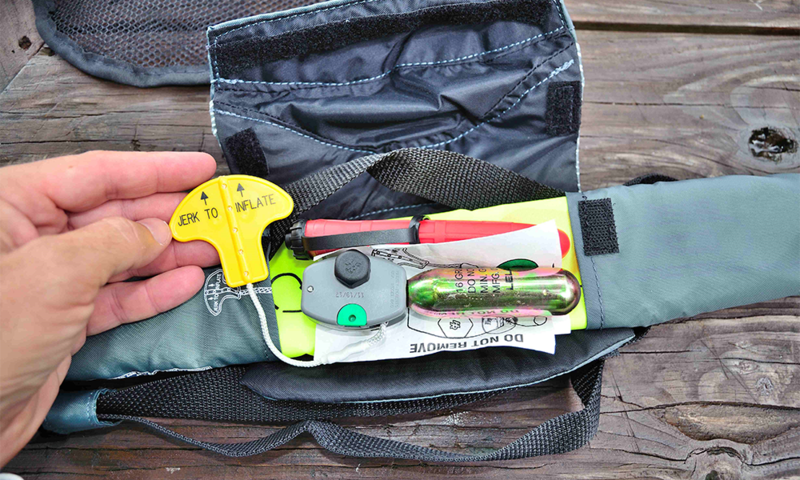 While most anglers are well within the law having these PFD’s in their possession, these life saving devices rarely perform effectively when out of reach the moment an emergency situation arises. Life jackets need to be worn to be effective and few anglers will fish wearing a traditional life jacket. And that is where specialty life jackets can be the new choice for consumers. The Onyx M-16 belt is the ideal addition to any anglers list of safety gear that can be easily worn without the bulk and weight of a traditional life jacket. 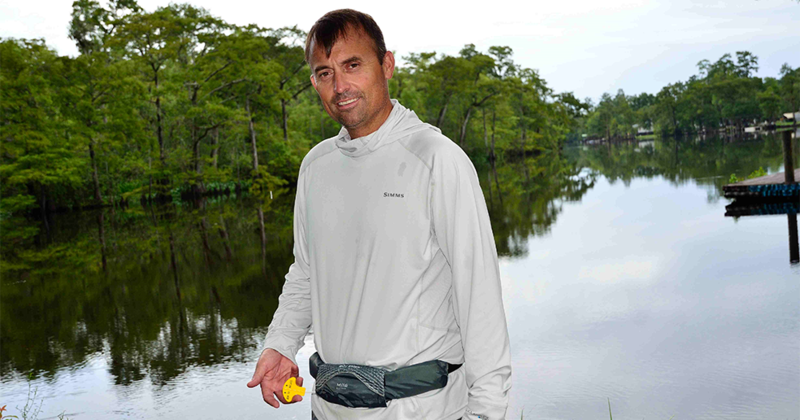 It is must-have gear for any angler or boater. The Onyx M-16 is the perfect safety gear in its benign state because of its compact, lightweight size. But, how well does this unit perform when activated? The Onyx instantly inflates using a 16-gram CO2 charge deployed from a pull cord conveniently located on the side. When fully inflated, the Onyx provides 26.5 pounds of buoyancy that can provide life saving protection for almost any sized adult. And in my experience, the unit deploys in just a few seconds from pulling the rip cord. As soon as the unit inflates, users can add additional air to the bladder with the red oral inflation tube. Or the red oral inflation tube can be used to inflate the bladder without use of the CO2 cartridge. After inflation, the black strap should be put around the neck to keep the bladder in place. 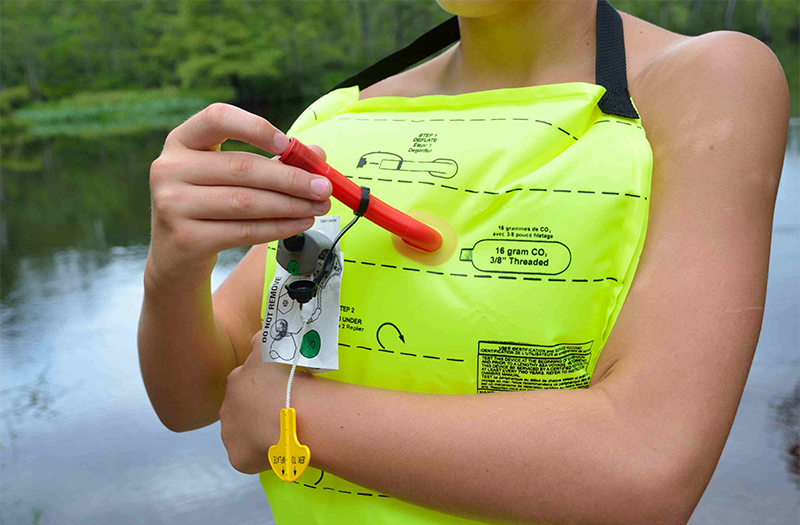 The PFD is designed for users to float on their back with arms crossed over the inflation pad. Buoyancy can be adjusted with the red manual valve as well by depressing the black cap on the end, where indicated, to remove excess air to adjust for comfort. One aspect of the Onyx that was different than expected was the shape of the inflation bladder. Many of the low profile belt packs have tubular designs that can do the job, but aren’t very forgiving in rough, choppy conditions. The Onyx provides a rectangular-shaped bladder that conforms more to the shape of the human torso more efficiently than tubular designs. 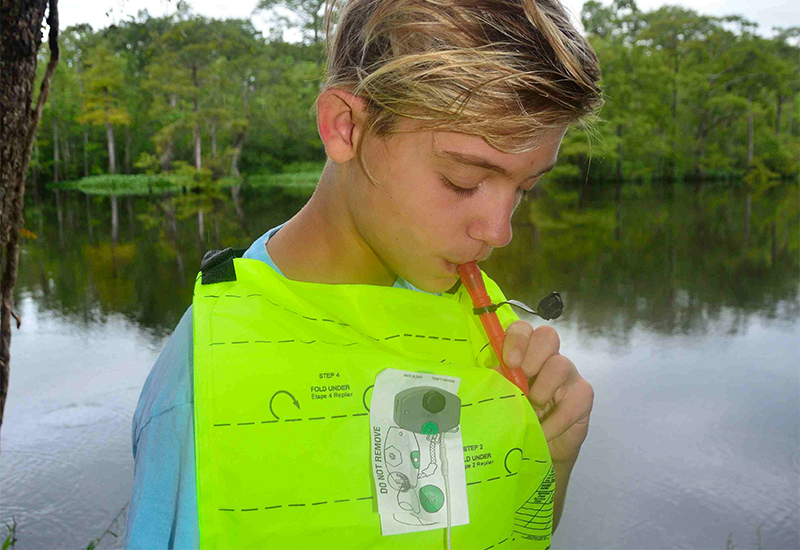 This allows the PFD to provide a more comfortable floating position while in the water. While some water rescues can be quick, in other instances people could be in the water for several hours. The rectangular-shaped design provides stability with less fatigue while floating around and waiting for rescue. A rather large inflation bladder erupts out of a small package in a relatively short duration. After testing the unit out for the first time, I began to wonder how I could re-pack this bladder back into the small package it came in. 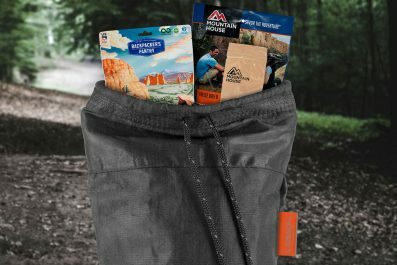 Luckily, repacking instructions are included with every purchase! I first squeezed out all of the air by rolling up the bladder while depressing the release valve. And while it took careful reading and attention to detail during my first experience, I had the unit correctly folded, re-packed, and re-armed with a new CO2 cartridge in just under five minutes. The Onyx M-16 Belt Pack is comfortable and extremely lightweight. While weight may not sound like something important when on a boat, it can be an important factor while on the boat all day. Few anglers spend much time sitting on the boat. Anglers are always on their feet and anything worn around the waist or on the back can eventually cause fatigue. Weight can be a major factor even when it’s measured in ounces rather than pounds. 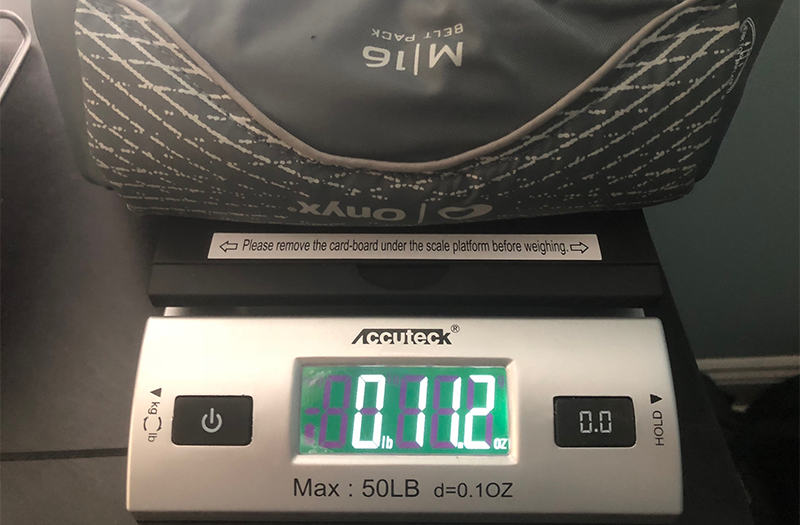 As a backpacker, I measure gear in ounces rather than in pounds. Any weight added to your body frame will eventually feel heavier after wearing for several hours, and this will eventually will cause fatigue. On backpacking trips, we look for every ounce we can find to eliminate to reduce fatigue and strain on the body. 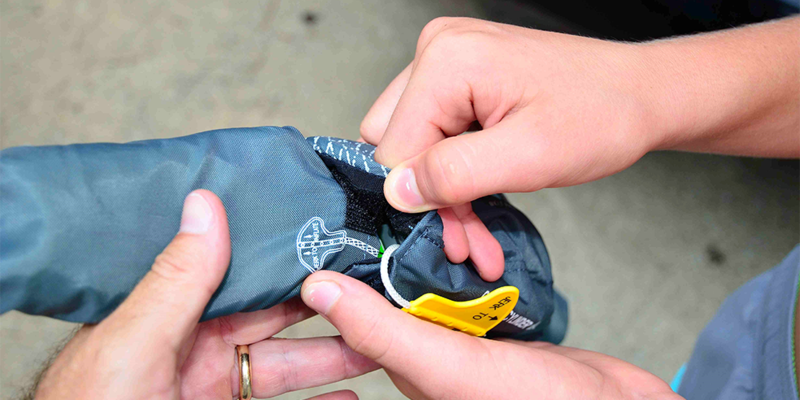 A heavy PFD can eventually cause displeasure due to configuration or the actual weight. If so, the unit will often get buried in the hatch with the rest of the PFD’s putting boaters at risk. Fortunately, the Onyx M-16 Belt Pack weighs only 11.2 ounces. That is definitely less than other units of similar size and shape. Comparable belt packs and other inflatable vests weigh 20 ounces or more, and this will eventually lead to muscle strain and fatigue. The Onyx is on the lighter side and was barely noticeable to me during my field testing over many long days in South Carolina’s summer heat. I am an avid angler and I put over 70 days on the water each year. In the past, I have relied on my swimming ability and a couple of Type III PFD’s lying on the deck of my boat to keep me and my passengers out of harm’s way… until now. The Onyx M-16 Belt Pack is my new friend and will always be around my waist while enjoying the great outdoors on my kayak, paddleboard, or 18-foot flats boat. Belt pack PFD’s such as the Onyx M-16 are economical and lightweight, and they are must-have equipment for anybody looking to spend any time on the water. It can be a true lifesaver. We’re dedicated to delivering your purchase as quickly and affordably as possible. We offer a range of delivery options including express, so you can choose the shipping method that best meets your needs. 1800GEAR.COM © 2019. All Rights Reserved.